1. Do IV cannulation to open a new IV access, in order to give Lasix IV STAT. The procedure of IV cannualtion perhaps will spend ten minutes. Although it is an invasive procedure, Lasix IV can be given 5 minutes earlier before the blood transfusion finishes. 2. Wait 15 minutes for the blood transfusion to finish. After 15 minutes, flush and use the same IV access site to give Lasix. However, it is not given as STAT, as 15 minutes passed. Both options have own advantage and disadvantage. Which option is the best one? As Daisy pointed out there are more factors to consider than what you've offered, and I get the feeling we've been doing a lot of your homework lately, my apologies if we've got that wrong. And as Daisy pointed out, STAT orders don't necessarily mean that the MD wants the med given in the next few minutes, prescribers often use that designation so that it doesn't take two hours before the patient gets the med, so if it's not clear if the prescriber wants it given before the transfusion has finished, then you could just ask. If it had to be given immediately, then you don't really need to start a new IV, pause the transfusion, flush the IV, given the Lasix, flush the IV, restart transfusion. The blood transfusion requires a dedicated infusion line. In other words, it is not supposed to use the same infusion line to administer other medications. Is it allowed to "pause the transfusion, flush the IV, given the Lasix, flush the IV, restart transfusion"? 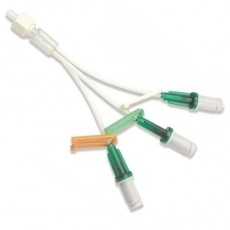 Does it break the requirement of a dedicated infusion line for blood transfusion? The general rule is that you shouldn't combine a blood product infusion with other infusions and to have both the transfusion and the medication in the line simultaneously, although even that is debatable. A peripheral IV that has been used for a transfusion can continue to be used when the transfusion is not running, it's not as though once the transfusion is done the IV has to be removed. Stopping, flushing, giving the med, then flushing again before restarting the transfusion would mean the transfusion and the medication are not running together, but separately. According to your reply "A peripheral IV that has been used for a transfusion can continue to be used when the transfusion is not running ... Stopping, flushing, giving the med, then flushing again before restarting the transfusion would mean the transfusion and the medication are not running together, but separately", does anyone else have the same understanding as MunoRN? Are you sure it is correct? According﻿ to your reply "A peripheral IV that has been used for a transfusion can continue to be used when the transfusion is not running ... Stopping, flushing, giving the med, then flushing again before restarting the transfusion would mean the transfusion and the medication are not running together, but separately", does anyone else have the same understandin﻿g as MunoRN? As this patient is on Lasix IV. In other words, the underlying condition could be fluid overload. How much Normal saline would you use to flush the line before and after medication administration? Could anyone please explain the complete meaning of "a dedicated infusion line"? In it's strictest sense a "dedicated infusion line" means a line that is only infusing one thing at a time into one site. This means that you do not run other IV fluids, antibiotics or any other type of drip into the same site. You also do not stop the drip to administer IV push medications. 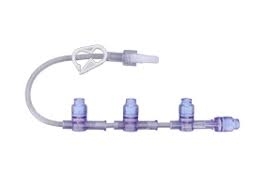 Sometimes you can use a set like these where the site isn't dedicated but the actual IV tubings are. So nothing is piggybacked into the actual IV tubing but more than one infusion is going into the same site as long as they are compatible. Examples of medications you might use these for are multiple pressors. Depending on the medications/fluids you are infusing you may be able to use this for IV push meds. Blood needs a dedicated site but it can be stopped briefly if you need to give an IV push med and you have no other alternative site. Nothing should be piggybacked into blood tubing and most blood administration sets are designed to not permit that anyway. The site can be used for other things when blood is not being administered so it is dedicated only during the transfusion. I think the confusion comes with the interchangeability of the terms "site" and "line". Please explain the complete meaning. Geez oh Pete how much more do you need? This is getting a little frustrating. Oh, and by the way you're welcome.